Reversed: Exhaustion, giving up, overwhelmed. The Seven of Wands reversed shows that external pressure is weighing you down, leaving you doubting yourself and whether everything is worth it. It may seem as if you are under constant opposition. At first, you could hold firm, but after a relentless battle, you are now exhausted and ready to give up altogether. Don’t let this get to you! Even if you are weary, this card urges you to keep fighting for what you believe in. Stand strong, own your position and don’t change who you are just to keep others happy. The Seven of Wands reversed can also mean you think others are perpetually criticising you. Your family or friends are questioning your choices, such as staying in a challenging relationship or an unfulfilling job, and you would prefer if they could just keep their mouths shut and let you be! 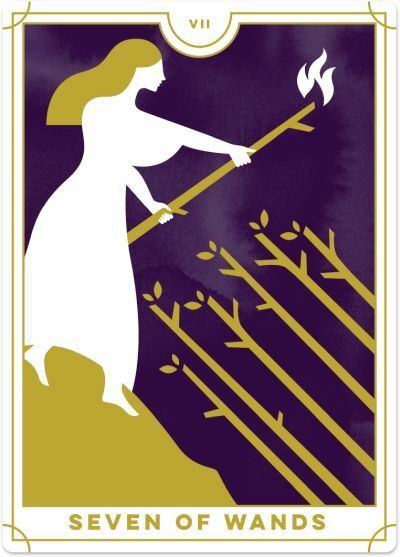 The Seven of Wands reversed serves as a reminder that you will not always win everyone over. There will still be challenges and opposition to your point of view, and you cannot keep everyone happy all the time. Thus, it is time to draw your line in the sand and say, ‘This is who I am, and this is what I need right now’. There cannot be any compromise or negotiation at this stage; hold your ground with determination and courage. The reversed Seven of Wands may affirm that you are overwhelmed by the challenges and responsibilities in your life, finding yourself quickly snowed under and unable to look at the bigger picture. You may have taken on too many commitments and now want to focus your attention on only one or two things. You may also worry that you must compete against others, leaving you feeling somewhat inadequate and vulnerable. Rebuild your self-esteem and confidence and have faith that you can achieve what you set out to do. Finally, the Seven of Wands reversed can appear when you are trying to avoid conflict wherever possible and, as a result, you are backing down from your point of view too easily (or too often). As soon as someone challenges or opposes you, you compromise or give in, instead of standing up for yourself. Is being accepted and liked by others more important than fighting for what you believe in? Alternatively, you may have tried everything and given it your best shot, but you now see it is not worth the struggle. Even though you might not have made any progress yet, it is time to let this one go and move on. Yes, it may feel like giving up but, in the long run, it will be for the best.